'Wedding Vibes,' Shibani Dandekar Captions Pic With Farhan Akhtar. But Should We Be Excited? 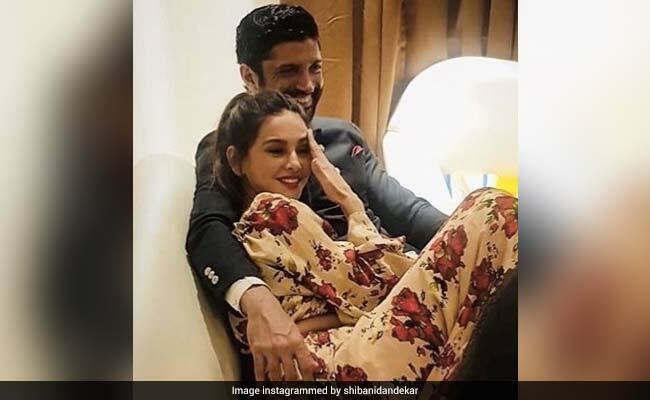 Shibani retweeted it to caption it as "wedding vibes"
Actor-filmmaker-singer Farhan Akhtar shared a cute photo of himself and his rumoured girlfriend Shibani Dandekar on Instagram and sent the Internet into a tizzy. Well, what caused a major meltdown on Instagram is actually Shibani's caption for the same photo, which she reposted on her wall. On Sunday evening, Farhan singled out a loved-up photo of himself and Shibani to dedicate a shayari, which appears to be his own composition, and wrote: "Tum muskuraado zaraa... Chiraag jalaado zaraa... andhera hataado zaraa... roshni phailaado zaraa... Apeksha dandekar." Meanwhile the next morning, Shibani Dandekar claimed that poetry is not really her forte and re-captioned the same photo in simpler terms. "I'm not good with the poetry so imma go with... wedding vibes with my Foo. My sister's wedding, just to be clear!" New bride Apeksha Dandekar is the younger sister of TV presenter-actress Shibani Dandekar and VJ Anushka Dandekar. Over the weekend, the three Dandekar sisters featured in a photo from Apeksha's wedding day and shared an adorable note for her sister: "Our baby goose is getting hitched today! Wishing you so much magic and laughter my Apeksha Dandekar, and Abhishek Sharma is a sweetheart! Total dude... love my new brother and I'm sure that together you will make a wonderful life for yourselves! So blessed to have such a beautiful soul as a baby sister and so proud of the woman you are! Have the best day ever Mrs (soon to be) Sharma but forever our little monster! Love you to the moon and back!" Meanwhile, Farhan Akhtar and Shibani Dandekar often trend for their loved-up photos, which go viral in almost no time. Like on Farhan Akhtar's birthday, Shibani wrote this for an adorable selfie of the two: "Because he has the coolest tattoo in the world and because it's his b'day! Happy birthday my sweet grumps, love you loads." Farhan Akhtar and Shibani Dandekar began making public appearances from some time in 2018 but neither of them has confirmed the dating rumours yet. Farhan Akhtar and Adhuna Bhabani divorced in April last year after 16 years of marriage. They are parents to two daughters Shakya and Akira. On the work front, Farhan is filming The Sky Is Pink, which also stars Priyanka Chopra.